MOSCOW, Russia -- The partial truce that Russia and the United States have thrashed out in Syria capped something of a foreign policy trifecta for President Vladimir V. Putin, with the Kremlin strong-arming itself into a pivotal role in the Middle East, Ukraine floundering and the European Union developing cracks like a badly glazed pot. President Vladimir V. Putin of Russia in Moscow on Tuesday. Putin hopes to break a consensus among the European Union’s 28 nations on economic sanctions imposed on Russia. Beyond what could well be a high point for Putin, however, lingering questions about Russia’s endgame arise in all three directions. In Syria, Russia achieved its main goal of shoring up the government of President Bashar al-Assad, long the Kremlin’s foremost Arab ally. Yet its ultimate objectives remain murky, not least navigating a graceful exit from the messy conflict. In Ukraine, Russia maintains a public commitment to implement a year-old peace agreement. Renewed fighting in the Russian-backed breakaway regions, however, suggests that Moscow seeks to further destabilize the Kiev government, already wobbly from internal political brawling. In Europe, Putin wants to deepen cracks in the European Union, hoping to break the 28-nation consensus behind the economic sanctions imposed on Russia over its annexation of Crimea in 2014. The Kremlin recently cranked up its propaganda machine to malign the German chancellor, Angela Merkel — viewed here as the central figure in the confrontation against Moscow — portraying her as barren and her country as suffering violent indigestion from too many immigrants. The target audience for these achievements is the Russian populace, partly to distract people from their deepening economic woes. “On screen we can see that we are so strong, we are so important, we are so great,” Nikolai Petrov, a political-science professor at the Moscow School for Higher Economics, said sarcastically. Putin announced the agreement to a “cessation of hostilities” in Syria on television late Monday night, underscoring its importance as a joint Russian-American effort. The Russian president has previously waxed nostalgic for the days when just two superpowers strode the world as problem-solving colossi, before the Soviet Union imploded. “Russia will conduct the necessary work with Damascus and the legitimate Syrian leadership,” Putin said, while the United States will do the same with its allies and opposition groups. There was more. Putin wanted to make clear that Russia’s intervention in Syria would avoid the kind of catastrophic collapse that occurred in Iraq, Libya and Yemen, lumped together improbably with the American-backed “color” revolutions in Ukraine in 2004 and Georgia in 2003. Russia sent up to 50 combat aircraft to an air base near the coastal Syrian city of Latakia in September, along with more than 4,000 troops to protect them. In that move, Russia was seen as having five main goals: stopping regime change abetted from outside the country; thwarting plans by Washington to isolate Moscow; proving that Russia was a more solid ally than the United States; showcasing new Russian weapons; and presenting a new foreign policy spectacle to a Russian public weary of the war in neighboring Ukraine. To some extent, all five goals have been achieved, prompting some voices to call for Russia to come home. “We have clear achievements; the main thing is that everybody now speaks to us,” Boris B. Nadezhdin, a former member of the Duma, Russia’s Parliament, said on a popular talk show. “Assad’s regime, or Syria’s legitimate government, has stayed in power,” he added. Syria remains unfinished business, however, and the roughly $3 million daily cost of the Syria operation is widely seen as affordable. 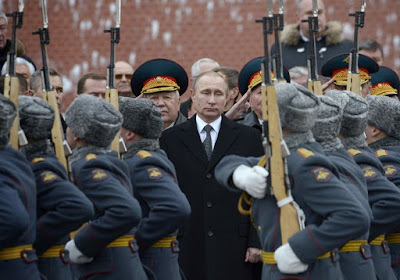 Putin has labeled it money well spent from the military training budget. Assad’s forces have nearly surrounded Aleppo, long an opposition stronghold. They will press the fight before the partial truce is set to begin on Saturday, and may well continue with attacks afterward. There is a gaping loophole in the agreement in that it permits attacks against the Islamic State and the Nusra Front, an Al Qaeda affiliate, to continue. This could work in Moscow’s favor, since many of the anti-Assad groups aligned with the United States fight alongside the Nusra Front and depend on it for support. Thus, while American allies are being asked to stop fighting Assad’s government, Russia and the Syrian government can continue to strike United States-backed rebel groups without fear, if history is any guide, of Washington’s doing anything to stop them. Ultimately, analysts believe that Russia wants to stick around long enough to supervise the transition to a new government in Syria; to ensure that Damascus remains a friendly capital; and to show that a political transition can be achieved through negotiations, not regime change. Assad just announced parliamentary elections for April 13. Moscow, not to say Assad, wants to avoid being surprised by a sudden power grab by the Sunni Muslims who form the backbone of the opposition and are hostile to Russia for supporting Assad. “The endgame for Russia is to move to the political process from a position of strength,” said Aleksandr Shumilin, a senior Middle East expert at the Russian Academy of Sciences. Among the complications is that Assad, who has grown bolder because of Russian and Iranian support, recently said he planned to reassert control over all of Syria. If Russia helps to vanquish the opposition in the western part of the country, only the Islamic State would remain as a formidable opponent. That would put Russia in the unpredictable position of supporting Damascus through the long, most likely bloody slog needed to dislodge the Islamic militants. In response, some Russian voices have lately taken to portraying Assad as the tail trying to wag the dog. The Syrian government should “follow Russia’s leadership in settling this crisis,” Vitaly I. Churkin, Russia’s ambassador to the United Nations, told the Kommersant daily newspaper. Another wild card for Moscow is its increasingly hostile relationship with Turkey, after a Russian warplane was shot down in November for briefly violating Turkish airspace. Russia accuses Turkey of plotting to invade Syria, and is likely to blame Ankara if the partial truce collapses. So far, however, the Kremlin can count Syria as a success. “It is very cheap, bloodless, there are no Russian victims and it is seen positively by Russian society,” said Petrov, the political-science professor. Syria has also worked to distract the Russian people from the war dragging on next door in Ukraine. The conflict excites for less nationalist passions. Yet it still serves Moscow’s interests by destabilizing the government of President Petro O. Poroshenko and discouraging warmer relations between Kiev and Europe — a Russian goal in tandem with lifting economic sanctions imposed over the annexation of Crimea. The economic sanctions cut off Russia’s access to Western credit markets, among other measures, which it desperately needs to weather its recession. The question is how best to persuade Europe and the United States to lift them. In part, the Russian intervention in Syria was meant to confirm Moscow’s role as a dependable partner in solving international problems and thus help spur an end to sanctions. But instead of attacking the Islamic State, Russia went after Western allies in the Syrian opposition, confirming its unreliable status to Western governments. So Moscow most likely views the tougher course of exploiting divisions in Europe as its best chance to end sanctions. One thing is certain for Russia, particularly in light of the crash in energy prices, said Konstantin von Eggert, an independent political commentator. “It cannot return to the global stage under a bunch of sanctions,” he said.